AKA, what I had for dinner last night. Years ago, I found a very simple recipe for "Chicken with two lemons" that I have made time and again ever since. I found the exact same recipe on line just now, so I'm pasting it here, but you could use any roast chicken method you like. (I can't usually get the skin to crisp and puff up as described, but it still looks and tastes delicious.) If you have some marinara in the freezer or (gasp!) can find a good jarred variety (not in my house! ), this is really a simple and satisfying meal. I didn't have any prepared last night and it was still quick and easy to make a simple sauce while the chicken baked and the polenta boiled. 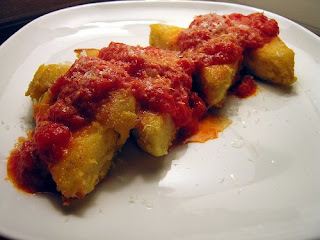 And don't be intimidated by polenta--it's super easy and delicious. People just like to complicate peasant food and make it fancy, but you don't have to. Serve the chicken alongside the polenta and sauce, and add a nice spinach salad or green veg if desired. 2. Wash the chicken thoroughly in cold water, both inside and out. Remove all the bits of fat hanging loose. Let the bird sit for about 10 minutes on a slightly tilted plate to let all the water drain out of it. Pat it thoroughly dry all over with cloth or paper towels. 3. Sprinkle a generous amount of salt and black pepper on the chicken, rubbing it with your fingers over all its body and into its cavity. 4. Wash the lemons in cold water and dry them with a towel. Soften each lemon by placing it on a counter and rolling it back and forth as you put firm downward pressure on it with the palm of your hand. Puncture the lemons in at least 20 places each, using a sturdy round toothpick, a trussing needle, a sharp-pointed fork, or similar implement. 5. Place both lemons in the birds cavity. Close up the opening with toothpicks or with trussing needle and string. Close it well, but dont make an absolutely airtight job of it because the chicken may burst. Run kitchen string from one leg to the other, tying it at both knuckle ends. Leave the legs in their natural position without pulling them tight. If the skin is unbroken, the chicken will puff up as it cooks, and the string serves only to keep the thighs from spreading apart and splitting the skin. 6. Put the chicken into a roasting pan, breast facing down. Do not add cooking fat of any kind. This bird is self-basting, so you need not fear it will stick to the pan. Place it in the upper third of the preheated oven. After 30 minutes, turn the chicken over to have the breast face up. When turning it, try not to puncture the skin. If kept intact, the chicken will swell like a balloon, which makes for an arresting presentation at the table later. Do not worry too much about it, however, because even if it fails to swell, the flavor will not be affected. 7. Cook for another 30 to 35 minutes, then turn the oven thermostat up to 400 degrees, and cook for an additional 20 minutes. Calculate between 20 and 25 minutes total cooking time for each pound. There is no need to turn the chicken again. 8. Whether your bird has puffed up or not, bring it to the table whole and leave the lemons inside until it is carved and opened. The juices that run out are perfectly delicious. Be sure to spoon them over the chicken slices. The lemons will have shriveled up, but they still contain some juice; do not squeeze them, they may squirt. Bring salted water to a rolling boil in a large pot. Slowly whisk in corn meal in a steady stream. Cover and allow to boil and bubble over medium heat, stirring every few minutes. In about 20 minutes, mixture should resemble a creamy but thick porridge (this is basically grits) and start to pull away from the sides of the pan. Turn off heat and stir in butter and cheese. Turn into a shallow baking dish (I have a smallish 8X10 rectangular dish that seems perfect for this amount of polenta) and smooth slightly, then let set for at least 10 minutes. To serve, just cut squares with a spatula and spoon sauce over. Delish!